Music is a meaningful part of Madison’s culture. Every season—and every day of the week—there are a wealth of ways to add live music into your itinerary. From classical music to karaoke … from classic clubs to fresh-air venues … from festivals honoring local acts to landmarks where celebrities kick-started their careers … you won’t want to miss the music scene in Madison! There’s no denying the influence Madison’s music scene has had on the world. For instance, Drummer Butch Vig of Garbage got his start in Madison—as did the careers of bands that recorded albums at Vig’s Smart Studios: Nirvana, Smashing Pumpkins, Everclear and Fallout Boy, to name a few. To this day, many notable musicians have made their homes in Madison, including James Brown’s former drummer Clyde Stubblefield. And acclaimed jazz bassist Richard Davis has been a professor at UW-Madison since 1977, though he’s drawn audiences worldwide and has a long list of performance and recording credits with stellar artists including Sarah Vaughan, Eric Dolphy, Frank Sinatra, Barbara Streisand, John Lennon and Miles Davis. If your formula for finding great music is finding the spots where locals go to listen to a live show, you won’t want to miss classic venues that make up Madison’s mix. You’ll find music events happening every week at the Nomad World Pub, which features live bands playing Latin jazz music on Tuesdays (bring your own jazz records—the audience is encouraged to play them afterwards! ), Jazz Jam Dance Sessions on Thursdays (one-hour dance lessons start at 8 p.m. with live music to follow) and a rotating lineup of musicians during Friday Jazz Sessions. 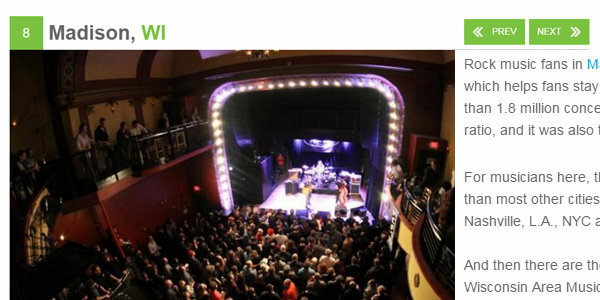 Other venues include The Orpheum Theater, a live performance and music theater centrally located on State Street. The Coliseum at Alliant Energy Center welcomes regional and national touring acts throughout the year. Don’t forget to check out the live music lineup at the Club Tavern in Middleton, one of the oldest taverns in Wisconsin. The Edgewater is making a splash on Lake Mendota with its First Thursday (of the month) line up, Brewgrass Fridays, and Live + Local Saturdays music events on the Plaza. The Memorial Union Terrace is considered to have one of the best views in Madison—and it’s made even better with music! Pull up a sunburst chair, grab a bite to eat and listen to live music while seated on the popular stone patio located alongside Lake Mendota. 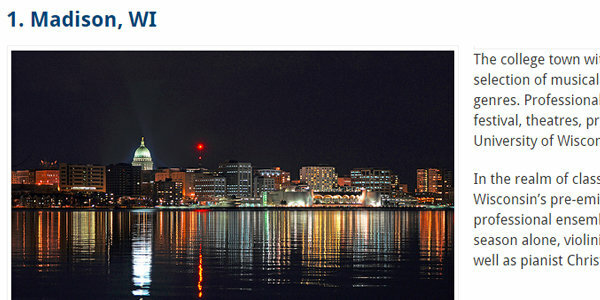 The Monona Terrace® features two summer music series events on its rooftop: Concerts on the Rooftop and Dane Dances, Enjoy free live music while watching the sun set over sparkling Lake Monona. Bringing your own blanket is the best way to reserve your seat for Concerts on the Square, the Wisconsin Chamber Orchestra’s six-week, Wednesday night concert series. Live on King Street has quickly become part of the urban fabric that makes Downtown Madison so special. Originally created to celebrate the end of summer, this multi-night, FREE concert series features national touring acts that perform on an outdoor stage with a stunning view of the capitol. 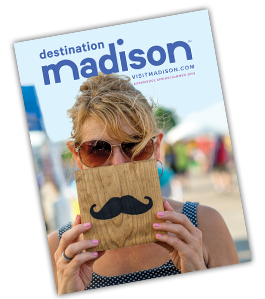 You’ll also find music on the King Street corner of the capitol on Tuesdays from June through August—Lunchtime Live is sponsored by Downtown Madison Inc. and features free performances by local acts ready to entertain local lunch-goers who flock to the capitol square. When it’s warm outside, we love to celebrate with food and music festivals. From Memorial Day to Labor Day and every week in between, it’s easy to fill your calendar with multi-day music events. Bratfest—A Madison tradition that kicks off summer, including local and regional acts along with one of the Midwest’s best menu items: grilled brats! Mad Gael Music Fest – Madison’s Irish Festival—Celebrate Irish and Scottish music and culture at this two-day music festival held downtown Madison at Breese Stevens Field. Be sure to check out their whiskey-tasting classes, cultural displays and exhibitions! Make Music Madison—This annual event is held on the summer solstice and features 400 concerts in over 100 venues. Yes, in one day! Sugar Maple Music Festival—This family-friendly, two-day outdoor festival celebrates traditional music and dance through performances, educational workshops and interactive jam sessions. Grab your dancin’ shoes and experience this summertime event held at Lake County Park. 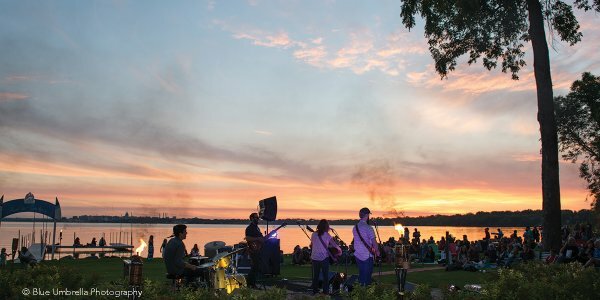 The Sunset Music Series—These Thursday evening events are held at the East Side Club, featuring great views of Lake Monona, a few food carts and live music for just $5. Taste of Madison—As summer winds down, four live stages spaced all around the Capitol Square heat up with local and regional acts that perform throughout Labor Day weekend. A perfect mix of eating and live entertainment! Yum Yum Fest—This one-day, end-of-summer celebration in Breese Stevens Field features dishes and drinks from twenty-nine of the most celebrated restaurants in the Madison Area paired with exciting regional and national music acts.